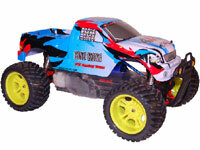 Free Shipping on all our RC Models anywhere in the continental USA! Big RC Models Provides Free Shipping on all RC Boats, Radio Controlled Trucks, R/C Helicopters and Large Scale Models! We carry some the largest gas powered remote control boats on the planet. These are not your typical electric toy boats, but rather R/C model boats four feet long with gas engines in them more commonly found in gas scooters. Comes complete with the radio control systems. True almost ready to run performance at unbeatable prices with free shipping. Check out our collection of RC Helicopters. Gaui Helicopters, Align RC Helicopters, and T-Rex. Huge savings when you buy our bundles complete with Hyperion LiPo Batteries. FS Monster Truck 4WD 1/5 Scale This is the first affordable 1/5th scale RTR Monster Truck on the market which has a 30cc 2 stroke engine putting out massive power with top speeds out of the box of up to 50 MPH. Copyright ©2007 Tiger Motion, Inc.